A list of small scale business ideas to start a small business. Here are 10 best small business ideas with small capital. This 10 business you can start with a little investment. 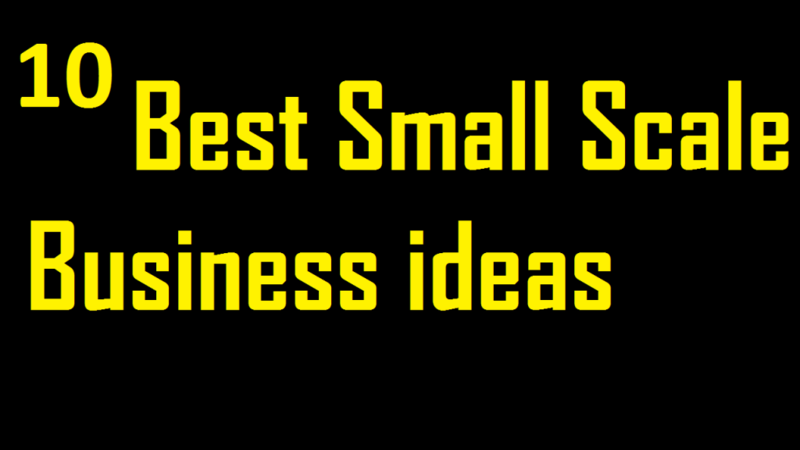 Here is the list of 10 small scale business ideas just for you. Poultry Farm. Poultry farming business is an old business but the demand of poultry farm is highly increasing due to demand of eggs and chicken meats. A poultry farm can be your next business because you can start with a small capital. There one need to invest $500 in starting own farm. Location and management very important for this business. Poultry farm is mainly two kinds, one is for eggs and another one is for meats. Broiler poultry farming business. The price of poultry feeds is costly that’s why most of the people are getting less profit. If you can make own feeds then it would be very profitable. Small scale business Grocery Store. A grocery store business indeed profitable in a busy area. It can be operated as an online business. The demand of grocery products is always high. To make a profit you have to make a good business plan and an investment policy. Fast food business. The food business is always trending business ideas. The fast food business is one of the most profitable small scale business ideas. One can run a fast food business as a side business also. The location is very important to get success in this industry. The most of the people are focused on foreign foods but there has a huge demand for local foods also in this food industry. Online shop. An online shop is another small scale business ideas. One can run a small online shop as a part-time business. Nowadays, there is very competition in this business. You have to with a different idea and products. Building a good relationship is the key to success in online shop business. Invest money in the Stock market. Investing in the stock market is another profitable business ideas if you can control greed and fear. The main reason for losing money on the stock market is a lack of knowledge, greed, fear, and over thinking. You should invest in the stock market because this industry is always changing. Clothing business. Clothing business is a profitable business idea for 2017. A small fashion house can be run as a side business by hiring staffs. Before starting a clothing business you need to make a business plan. Indeed it is a profitable business idea for small investors. Make a YouTube Channel. YouTube is the second search engine after google. You can make money on YouTube by uploading your own videos. In general, you will be paid $1 to $1.5 for thousand views. The main advantage, there is no earning limitations and the best passive income source. The most interesting fact that, it is very small scale business. Furniture Business. If you have huge ideas on furniture then you can easily start a furniture business. You can earn 30% or more as profit. Before starting a furniture business you have to come with the business plan and as well as a marketing plan. Food cart business. A Food cart business is highly interesting business with a small investment. This business is a low investment business that’s why student entrepreneurs can easily start food cart business. The main problem is, in many countries food cart business is not allowing. A gift shop business. I like this business because it is highly profitable. Busy areas, the shopping mall is the best places to start a gift shop business. You can make your business online also.